Ahl, E. 1926. Neue oder selten importierte Fische, III. Blätt. Aquar. Terrarienkunde 37(14): 346-348. Bruton, M.N., P.B.N. Jackson and P.H. Skelton (1982) Pocket guide to the freshwater fishes of southern Africa. : Cape Town (South Africa): Centaur Publishers, p.88. Schliewen, U.K. (1992) Aquarium fish. : Barron's Education Series, Incorporated. 159 p.
Skelton, P.H. (1993) A complete guide to the freshwater fishes of southern Africa. : Southern Book Publishers. 388 p.
Wildekamp, R.H., R. Romand and J.J. Scheel (1986) Cyprinodontidae. : p. 165-276. In J. Daget, J.-P. Gosse and D.F.E. Thys van den Audenaerde (eds.) 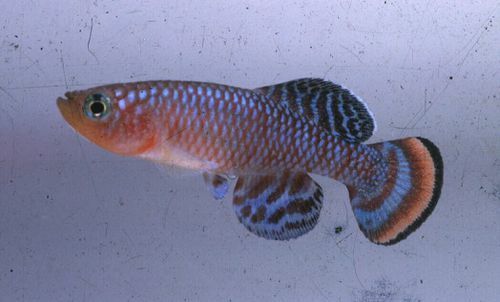 Check-list of the freshwater fishes of Africa (CLOFFA). ISNB, Brussels, MRAC; Tervuren; and ORSTOM, Paris. Vol. 2.